Because of the resistance to allowing women on board, many female pirates did not identify themselves as such. Anne Bonny, for example, dressed and acted as a man while on Captain Calico Jack's ship. :285 She and Mary Read, another female pirate, are often identified as being unique in this regard. This article contains a list of female pirates who are recognized by historians, listed in the time period they were active. Rusla Norwegian Fought against her brother Thrond for the thrones of both Denmark and Norway. Possibly fictional. Recorded in Saxo Grammaticus' Gesta Danorum (History of the Danes). Johannes Steenstrup linked her to the Ingean Ruadh (Red Maid) of Irish folklore. Stikla Norwegian Sister of Rusila: Became a pirate to avoid marriage. Recorded in the Gesta Danorum. Princess Sela c. 420 A.D. Norwegian Sister of Koller, king of Norway. Horwendil (later to be father of Amleth/Hamlet) was King of Jutland but gave up the throne to become a pirate. Koller "deemed it would be a handsome deed" to kill the pirate and sailed to find the pirate fleet. Horwendil killed Koller but had to later kill Sela, who was a skilled warrior and experienced pirate, to end the war. Recorded in the Gesta Danorum. Alvid Norwegian Leader of a group of male and female pirates. Also recorded in the Gesta Danorum. Wigbiorg, Hetha and Wisna c. 8th century A.D. Norwegian All three are listed in the Gesta Danorum as sea captains. Wigbiorg died in battle, Hetha became queen of Zealand, and Wisna lost a hand in a duel. Alfhild a.k.a. Ælfhild, Alwilda, Alvilda, Awilda post-850 A.D. Swedish Existence is disputed. Often wrongly dated to the 5th century. Ladgerda c. 870 A.D. Norwegian Ladgerda is the inspiration for Hermintrude in Shakespeare's Hamlet. Æthelflæd A.K.A. The Lady of the Mercians 872-918 911-918 English Eldest daughter of Alfred the Great of England. Became the military leader of the Anglo-Saxons after her husband's death in battle against the Danes in 911. Took command of the fleets to rid the seas of the Viking raiders. Jeanne de Clisson 1300-1359 1343-1356 Breton The "Lioness of Brittany". A Breton woman who became a pirate to avenge the execution of her husband. Attacked only French vessels. Elise Eskilsdotter d. 1483 1460s-1470s Norwegian A Norwegian noble who became a pirate to avenge the execution of her husband. She operated outside the sea of the city of Bergen. Gráinne Ní Mháille A.K.A. Gráinne Mhaol, Granuaile, Grace O'Malley, "The Sea Queen of Connaught" 1530-1603 Irish Gráinne Ní Mháille was Queen of Umaill, chieftain of the Ó Máille clan and a pirate in 16th century Ireland. She is an important figure in Irish folklore, and a historical figure in 16th century Irish history, and is sometimes known as "The Sea Queen Of Connaught". Biographies of her have been written primarily in the 20th and 21st centuries by the historian Anne Chambers. (full name Sayyida al-Hurra ibn Banu Rashid al-Mandri al-Wattasi Hakima Tatwan) 1510-1542 Moroccan Allied with the Turkish corsair Barbaros of Algiers. al Hurra controlled the western Mediterranean Sea while Barbaros controlled the eastern. Also prefect of Tétouan. In 1515 she became the last person in Islamic history to legitimately hold the title of "al Hurra" or Queen following the death of her husband who ruled Tétouan. She later married the King of Morocco, Ahmed al-Wattasi, but refused to leave Tétouan to do so. This marriage is the only time in Moroccan history a King has married away from the capital Fez. *al Hurra is also the name of an American Arab language pirate radio station used as a counter to al Jazeera. Lady Mary Killigrew 1530-1570 English Mary was the daughter of a former Suffolk pirate. Mary's husband Sir Henry Killigrew, a former pirate himself, was made a Vice-Admiral by Queen Elizabeth I and tasked with suppressing piracy. Whenever her husband went to sea, Mary engaged in piracy using the staff of her castle (Arwenack Castle in Cornwall) as crew and possibly with the Queen's knowledge. In 1570, she captured a German merchant ship off Falmouth and her crew sailed it to Ireland to sell. However, the owner of this ship was a friend of Queen Elizabeth, who then had Lady Mary arrested and brought to trial at the Launceston assizes. Some sources say she was sentenced to death and then pardoned by the Queen, but this is due to confusion with another family member. According to sources, her family either bribed the jurors and she was acquitted, or Queen Elizabeth arranged a short jail sentence. Whatever transpired, she gave up piracy and took up fencing stolen goods until she died several years later. Jacquotte Delahaye 1650s-1660s French Haitian Caribbean pirate. Also known as "Back from the Dead Red" due to her red hair and return to piracy after faking her own death and hiding dressed as a man for several years. Christina Anna Skytte 1643-1677 1650s-1660s Swedish She actively participated in the secret piracy conducted by her brother and spouse in the Baltic sea. Anne Dieu-le-Veut A.K.A. Marie-Anne and Marianne 1661-1710 1690s-1704 French Caribbean pirate and later based in Mississippi after Tortuga was closed down. Dieu-Le-Veut was a nickname meaning "God wills it" and given to her as it seemed anything she wanted God gave her. Married to a pirate, Anne challenged pirate Laurens de Graaf to a duel after he killed her husband in 1683. He refused and she became his common law wife, fighting by his side and sharing command. During the Golden Age of Piracy, many men had to leave home to find employment or set sail for economic reasons. :283 This left women with the responsibilities of taking on traditionally male roles and filling the jobs that were left behind. The need for women to fill these roles led them to be granted rights that had historically been exclusive to men. Women were allowed to trade, own ships, and work as retailers. Often they were innkeepers or ran alehouses. In some seaside towns, laws were even written to allow widows to keep their husbands' responsibilities and property. This was important to local economies, as alehouses and other such establishments were centers of commerce, where pirates would congregate and trade with each other and with the people onshore. As heads of these establishments, women had a considerable amount of freedom in business. They boarded and fed pirates, bought illegally pirated goods, acted as pawnbrokers for pirates, and even gave out loans - something many men, let alone women, viewed with great caution in that time period. :284 At times, female business owners would even hide their clients when authorities came looking to arrest them for piracy. Because of the resistance to allowing women on board, many female pirates did not identify themselves as such. 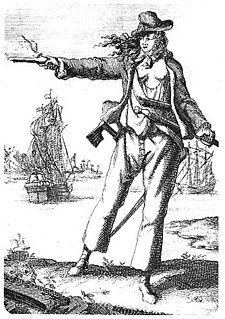 Anne Bonny, for example, dressed and acted as a man while on Captain Calico Jack's ship. :285 She and Mary Read, another female pirate, are often identified as being unique in this regard. However, many women dressed as men during the Golden Age of Piracy, in an effort to take advantage of the many rights, privileges, and freedoms that were exclusive to men. Maria Lindsey Early 1700s English The wife of Captain Eric Cobham and possibly fictional. Pirate operating on the Canadian east coast. Maria Cobham Early 1700s English Often listed separately in lists of pirates but is likely to be Maria Lindsey (see above). Ingela Gathenhielm 1692-1729 1710-1721 Swedish Baltic pirate. Wife and partner of legendary pirate Lars Gathenhielm. Took sole control following his death in 1718. Anne Bonny born Anne Cormac, aliases Ann Bonn and Ann Fulford, possibly also Sarah Bonny 1698-1782 1719-1720 Irish Caribbean pirate. Married to pirate James Bonny, had an affair with pirate John "Calico Jack" Rackham, and later joined his crew. Discovered another crew member Mark Read was secretly a woman (Mary Read) and the two became very close. Mary Read, alias Mark Read c.1690-1721 1718-1720 English Caribbean pirate. As a man, Mary went to sea and later joined the British army, fighting in the War Of The Spanish Succession. Mary married and settled down as a woman but returned to male dress following the death of her husband, later boarding a ship bound for the West Indies. Captured by "Calico" Jack Rackham, Mary joined his crew. In 1721, she died in prison. Mary Farley, alias Mary /Martha Farlee / Harley / Harvey 1725-1726 Irish In 1725, Mary Harvey and her husband Thomas were transported to the Province of Carolina as felons. In 1726, Mary and three men were tried for piracy. Two of the men were hanged (their leader John Vidal was convicted and later pardoned) but Mary was released. Her husband Thomas was never caught. Mary Crickett (or Critchett / Crichett) 1728 English In 1728, Mary Crickett and Edmund Williams were transported to the colony of Virginia together as felons. In 1729, along with four other men, both were convicted of piracy and hanged. Flora Burn 1751 English Operated on the East Coast of North America. Rachel Wall 1760-1789 1770s American Married George Wall, a former privateer who served in the Revolutionary War, when she was sixteen years old. Operated on the New England Coast. Thought to be the first American female pirate. In 1782, George and the rest of his crew were drowned in a storm. She was accused of robbery in 1789 and confessed to being a pirate. She was convicted and sentenced to death by hanging. Charlotte de Berry 1700s English Possibly fictional. Ching Shih 1775-1844 1801-1810 Chinese She was a prostitute who married a pirate and rose to prominence after his death. Regarded as one of the most powerful pirates in human history, she commanded her husband's fleet after his death. While the fleet she inherited was already large, she further increased the number of ships and crew. At its height, her fleet was composed of more than 1,500 ships and 80,000 sailors. She controlled much of the waters of the South China Sea. After years of piracy during which British, Chinese and Portuguese navies could not defeat her, China offered her peace in 1810 and she was able to retire and married the second in command. Charlotte Badger and Catherine Hagerty 1806 English Widely considered to be the first Australian female pirate. The ship Venus, due to a shortage of man-power, took on convicts including Badger and Hagerty as crew while in Australia. After docking at Port Dalrymple, Tasmania, the Captain went ashore and the crew seized the ship, sailing for New Zealand. Hagerty along with two other convicts, a woman named Charlotte Edgar and a child were put ashore at the Bay of Islands with a supply of stores. Hagerty died shortly thereafter. The two men were arrested for piracy and Edgar remained to become one of the first settlers in New Zealand. Badger was never seen again. Margaret Croke (Margaret Jordan) 1809 Canadian Following a dispute with investors over his schooner The Three Sisters, Edward Jordan was on his way to Halifax to sort it out. Wrongly assuming his family was being sent to debtors' prison, he killed two crewman then threw the Captain overboard before commandeering the vessel with the help of the remaining crewman. The marooned Captain survived and testified against Jordan claiming Margaret, who was aboard with her son and three young daughters, was also involved. Margaret admitted hitting the Captain after he had hit her husband during an argument in her cabin before he decided to commandeer the vessel; the other crew member testified she was actually in fear for her life from her violent husband and had attempted to escape. Both Margaret and Edward were hanged for piracy. Johanna Hård 1789-1851 1823 Swedish Sweden's last pirate; in 1823, recently widowed Hård, a farm owner on Vrångö Island, was arrested along with her farmhand Anders Andersson, farmer Christen Andersson, and one of Christen's farmhands Carl Börjesson and boatman Johan Andersson Flatås of Göteborg for piracy after the Danish ship Frau Mette was found beached and plundered with a murdered crew. Evidence was presented that the five had followed the Frau Mette on Flatås fishing vessel the Styrsö and requested water. After boarding her they killed the crew. Johan Andersson Flatås, Anders Andersson, and Christen Andersson were sentenced to death and beheaded. Carl Börjesson was imprisoned in Karlstens fortress where he died 1853. The evidence against Johanna Hård was insufficient and she was released and subsequently disappeared. Sadie the Goat 1869 American Possibly fictional. Operated around the state of New York as a member of the Charlton Street Gang. Named for her habit of headbutting her victims before taking their money. Lo Hon-cho alias Hon-cho Lo 1920s Chinese Took command of 64 ships after her husband’s death in 1921. Youthful and reported to be pretty, she gained the reputation of being the most ruthless of all China's pirates. Lo Hon-cho's fleet attacked villages and fishing fleets in the seas around Beihai taking young women as prisoners and later selling them into slavery. In 1922 a Chinese warship intercepted the fleet destroying 40 vessels. Despite escaping, Lo Hon-cho was later handed to authorities by the remaining pirates in exchange for clemency. Lai Sho Sz’en alias Lai Choi San 1922-1939 Chinese Operated in the South China Sea. Commanded 12 ships. Huang P’ei-mei 1937-1950s Chinese Led 50,000 pirates. 1970s-1990s Chinese Operated in the South China Sea smuggling thousands of Chinese immigrants to the U.S. and Europe. Was convicted in the U.S. and sentenced to 35 years in prison. Died in 2014. While most fictional and dramatic depictions of pirates have been male, some notable female pirates have been depicted. Nami, Nico Robin, Boa Hancock, Charlotte Linlin, and Jewelry Bonney, among others from the manga and anime series, One Piece. Space Pirate Sheila from Korean anime "Space Thunder Kids." Captain Marika Kato of the Bentenmaru from Bodacious Space Pirates. Captain Dola of Laputa - Castle in the Sky, by Ghibli Studios. Janme Dark from Aoike Yasuko's "Sons of Eve" manga series. Blackboots from Mary Hanson-Roberts' graphic novel Here Comes A Candle. Marquise Spinneret Mindfang from the webcomic Homestuck. Morgan Adams (played by Geena Davis) from the 1995 film Cutthroat Island. Nebula (Gina Torres) from the TV series Hercules: The Legendary Journeys. Elizabeth Swann (Keira Knightley) from Disney's Pirates of the Caribbean films. Tia Dalma (Naomie Harris) from Disney's Pirates of the Caribbean films. Mistress Ching (Takayo Fischer) from Disney's Pirates of the Caribbean: At World's End film. Angelica (Penelope Cruz) from Disney's Pirates of the Caribbean: On Stranger Tides film. Elizabeth Bonny (Anna Friel) from SyFy Network's Neverland (miniseries). The "surprisingly curvaceous" pirate (voiced by Ashley Jensen) from the 2012 animation The Pirates! In an Adventure with Scientists!. Anne Bonny (Clara Paget) in the pirate-themed TV series Black Sails. Anne of the Indies (Jean Peters) the amazing film by Jacques Tourneur, 1951! Bêlit from Robert E. Howard's Conan short-story "Queen of the Black Coast" and related media. Mary "Jacky" Faber, from the young adult novel, Bloody Jack, and its sequels. Art Blastside, a.k.a. Piratica, Little Goldie Girl, and several others from Tanith Lee's Piratica Series. Nancy Kington and Minerva Sharpe in Pirates by Celia Rees. The Surprisingly Curvaceous Pirate from Gideon Defoe's The Pirates! series of books. Emer from A.S. King's young adult novel The Dust of 100 Dogs. Esmerelda from "The Price of Freedom", a book based on the young life of Captain Jack Sparrow from Disney's Pirates of the Caribbean. Alosa, fierce captain of her own female dominated crew, from Tricia Levenseller's "Daughter of the Pirate King" and sequel "Daughter of the Siren Queen" (duology). ^ Were there really woman pirates? ^ a b c d e f g Pennell, C. R. 2001. Bandits at sea : A pirates reader. New York: New York University Press. ^ a b c d e f g Grammaticus, Saxo (November 11, 2006). The Danish History, Books I-IX. Project Gutenberg. Retrieved 2008-07-02. ^ "Vincent Cheng Talkasia Transcript". CNN. October 7, 2005. Driscoll, Sally (2009). Anne Bonny: "revenge". Great Neck Publishing. Druett, Joan (2000). She Captains: Heroines and Hellions of the Sea. Simon & Schuster. Lorimer, Sara (2002). Booty: Girl Pirates on the High Seas. Chronicle Books. This page was last edited on 9 April 2019, at 09:44 (UTC).